The GAA have announced the new package to cover the period 2014-2017. 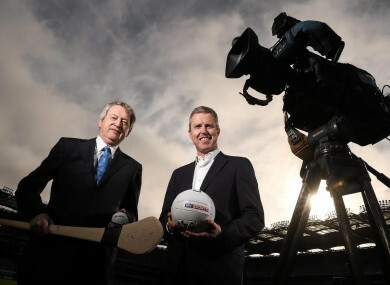 Ard Stiúrthóir of the GAA Páraic Duffy, left, and JD Buckley, Managing Director, Sky Ireland. SKY SPORTS WILL broadcast 14 exclusive GAA championship games this summer as part of the new TV rights deal. Within Ireland, a total of 45 provincial and All-Ireland championship matches will be broadcast live on television annually for the next three years: a total of 31 games will be shown by RTÉ (as per the last contract) and 14 by Sky Sports. Sky Sports games consist of eight Saturday evening matches in the All-Ireland qualifiers, two All-Ireland football championship quarter-finals, and two Saturday evening and two Sunday provincial championship games. Their first game will be the meeting of Kilkenny and Offaly in the Leinster SHC on June 7th followed by the clash of Dublin and Wexford in the Leinster SHC on June 14th. Their other live provincial games will be Sligo against Galway or London in the Connacht SFC on June 21st and the Ulster semi-final between Armagh/Cavan against Down/Tyrone/Monaghan on June 28th. There will also be a midweek highlights show. In addition to these 14 games, Sky Sports will also broadcast live the All-Ireland hurling and football semi-finals and finals, thus making 20 live games available to its subscribers throughout Britain and Ireland. All games broadcast on Sky and the majority on RTÉ will be shown in HD. The 31 championship games to be televised by RTÉ include the All-Ireland finals and semi-finals in both codes, the All-Ireland hurling quarter-finals, and two of the four All-Ireland football quarter-finals. RTÉ have also secured the rights to all six Provincial championship finals, while the remainder of the 31 games to be shown live on RTÉ are a mixture of provincial championship and qualifier games. Ulster championship games covered by RTÉ, including the provincial football final, will also be broadcast on BBC Northern Ireland. The GAA has also delivered on its promise to address access to its major games for those living outside of Ireland. In addition to Sky Sports providing exclusive live coverage of 20 championship matches in Britain, in a major new departure, Channel 7 will show all 45 live championship games free to air in Australia. In addition a new online streaming service – a joint venture between the GAA and RTÉ Digital – will allow supporters living in the US gain worldwide access to all games televised live in Ireland via the internet on PC, desktops, laptops, tablets, smart phones and other connected devices. Games will be streamed in high quality HD and subscribers to this service will also be able to view The Sunday Game. TG4’s will retain coverage of Sunday afternoon Allianz League matches. TG4 has also been awarded coverage of the All-Ireland minor finals, AIB club championships, Fitzgibbon and Sigerson Cups, the All-Ireland Post-Primary championships, the Cadbury U21FC, Bord Gáis Energy U21 HC and county finals. It is anticipated that TG4 will again cover 62 live and 22 deferred games in each of the three years. Setanta Sports will continue to broadcast Saturday evening Allianz league games. Radio coverage of GAA games remains with RTÉ and Newstalk, while Raidió na Gaeltachta will continue to broadcast both league and championship games trí Gaeilge. Today FM continue to provide score flash updates. In addition, the GAA intends to renew its successful local radio partnership with the Independent Broadcasters of Ireland (IBI) in the coming weeks. Email “Sky Sports set to broadcast GAA championship games this summer as TV deal announced”. Feedback on “Sky Sports set to broadcast GAA championship games this summer as TV deal announced”.